AdWork Media is excited to announce that a new and improved version of our Desktop Stats App is now available. A member of the AWM community was kind enough to code a new desktop stats app for AdWork Media Publishers! The new application works with all Windows computers and can minimize to your tray menu while running in the background. 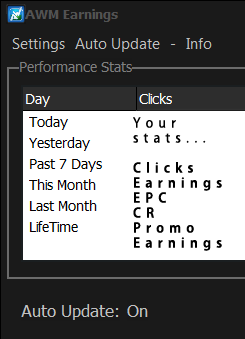 It also auto updates each minute so you can easily track your earnings in near real-time. You can download the new application from our AWM Publisher Tools page! Please scroll to the bottom under “Apps/Plugins” for the direct download link! Please share your feedback with us so we can continue to improve our apps and plugins! The new app is working nicely…thanks!